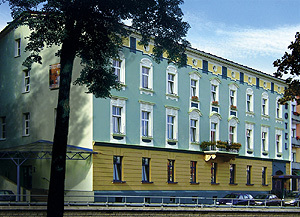 Polonia Hotel in Raciborz restored to its former glory - welcomes the guests visiting it since already 1850. We offer 23 tastefully furnished rooms with bathrooms and 4 suites. All rooms are equipped with telephone, fridge with mini-bar, radio and tv set. Additionally, at our guests disposal is a sauna with fitness facilities, professionally equipped conference room for 50 people and stylish hotel club. The guests may use the safe deposit , ATM and internet. We are able to accomodate the disabled in specially prepared rooms. Close to Raciborz are 2 not crowded border passes to Czech Republic, and the city's surroundings have forests and ponds of "Pocysterski" Natural Forest. We are an ideal place for rest and getting fit before or after the border's crossing. If you wish to return to the atmosphere of the past please visit our hotel. Animals are allowed free of charge. We accept the following credit cards: VISA, MASTERCARD, AMERICAN EXPRESS, EUROCARD, and others. The hotel is located in the city centre opposite the main railway and bus station.